It’s finally there! The announcement was made today that IBM Lotus Quickr V8.5 will be released on September 13th. This release was long anticipated! Early 2009, on the eve of the Quickr 8.2 release the DomDoc redbook team I was on describing a migration path from the DomDoc platform to Quickr was already told some of the features likely to be in the 8.5 release. One (folder security) even made it into the Redbook itself as an announcement for the next (8.5) release. At that moment, we didn’t know it would take until September 2010 to actually get that release. So it feels really good that it’s here now and I can’t wait to start working with it! I’ve been busy, really busy the last couple of weeks. Mostly with writing jobs I had to finish. I’m still working on an article and apart from that have been really busy with several reports and Functional Design documents so writing on my blog kind of fell in between. But in the midst of all that writing I got a good old basic user problem to solve today. A notes 5.0 mail file (yes, I know this customer is really taking his time to upgrade) that had problems with it’s Signature and Archive settings. they seemed to randomly disappear. Fixup didn’t help and to rule out other problems with the profile information documents I decided to simply delete those. Now I’ve done that literally dozens of times with the calendar profile so knowing how to address that profile was no problem. 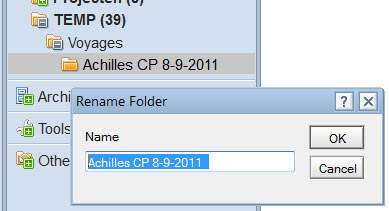 I wasn’t sure about the Archive profile name though, so to be sure I dove into the code to see how it was addressed. Mmm…..not a method I am familiar with so I tried the help to see what it did. But I got no luck there, no mention of the method in the help files. Unusual, Domino methods usually are pretty well documented but at the same time: No problem, the notes community is so well organized that I was sure that I wasn’t the first one looking for this. So I turned to the biggest help file imaginable: The Internet. Within a couple of seconds I googled several entries noticing what I noticed, that the method wasn’t actually documented although it has been in use since Lotus Notes 5.0. But more importantly, they also provided me with the answer I was looking for: The archive profile is addressed as, yes you guessed it: “Archive Profile”. Go figure. That simple and predictable answer could have cost me a lot of time hadn’t there have been the Internet. How I ever survived before…..I really don’t know! ps. Deleting the profiles did the trick as I expected.